The global health and wellness market is valued at almost $4 trillion annually, and the media plays a central role in consumer buying decisions. So spotting trends in the media coverage about this can generate a lot of hugely valuable insights, as well as telling us some interesting facts about the global health and wellness industry. With this in mind, we decided to look into what was published in the Health category last month and see what we find. In February, our News API gathered, analyzed, and indexed over 2.5 million new stories as they were published, giving us a huge enriched dataset of news content to look into. About 70,000 or so of these articles were categorized as belonging to the Health category (seems low right? if you’re wondering why, take a look at this previous blog, where we looked into the most popular categories and saw that Sports, News, and a few others have vastly greater publishing volumes than the rest). What publishing patterns could we identify over the course of the month? What consumers were these stories aimed at? What was the sentiment in these stories? Who and what was being talked about in these stories? If you want to dive into this content for yourself, grab an API key to start your free trial, and get up and running in minutes. How many stories are published in the Health category every day? To find out what patterns of publication the stories in the Health category followed, we used the Time Series endpoint to see the daily count of new stories from the past 8 weeks and plotted the results on the chart below. You can see a clear pattern in publication volumes in the chart below, with the average weekday volume of new Health stories being around 3,000 stories. On the weekends (when most journalists/writers are off work), this dips by about two thirds to 1,000 new stories per day. We can also see two noticeable spikes that break this trend in the first and last weeks of February. By narrowing down the time period of our search, we can see that this increased coverage in the first week was due to the announcement of a new health industry venture between Amazon and Berkshire Hathaway, while the second spike was caused by the release of a study that found a correlation between alcohol consumption and early-onset dementia. Does the Health & Wellness coverage talk about men or women more? Was the Sentiment of Health & Wellness stories different for Men and Women? Knowing that there were much more Health & Wellness stories aimed at women than men is a valuable insight in itself, but using the News API we can go further and analyze the sentiment of each of these stories. The News APIs Trends endpoint allows you to do exactly this – every time the News API collects a new story, it analyzes the sentiment of each one. Using the Trends endpoint, you can search for the volume of stories containing positive, negative, and neutral tone. You can see below that stories in the health category with “women” in the title were generally evenly balanced between positive, negative, and neutral. On the other hand, stories in the same category that contained “men” in the title tended to be more negative than positive, with 47% of these storeies containing a negative tone. What entities did the Health stories about women mention? So far we have seen that in the 70,000 news stories published about health last month, much more are about women’s health than men’s health, and the stories about women’s health tend to have a more positive tone than the stories about men’s health. With the News API, we can dive further into these stories and see exactly what people, things, and organizations are mentioned the most. Using the Trends endpoint, we gathered all of the entities mentioned in Health stories with “women” in the title and plotted them on the chart below. You can see that ‘study’ is frequently mentioned in these stories. With the Stories endpoint, we can go further into the trends from last month and see the actual news stories that made up these spikes. We took a random selection of three stories from each of the two spikes in stories that mention “study” in the title. Give women more time to give birth, make choices: WHO, Reuters. It’s Awful How Many American Women Die Giving Birth – and Inexcusable That Most Deaths Are Preventable Mother Jones. Cleaning Products Could Cause Lung Damage In Women, Study Finds CBS Los Angeles. House Cleaning Damages Women’s Lungs Just As Smoking A Packet Of Cigarettes Damages Men’s Lungs India Times. Home cleaning products may be as harmful as 20 cigarettes a day, WHSV. That concludes our high-level look into February’s publishing trends in the Health category. If you have an interest in this category, use the link below to grab an API key and start digging into the data yourself. 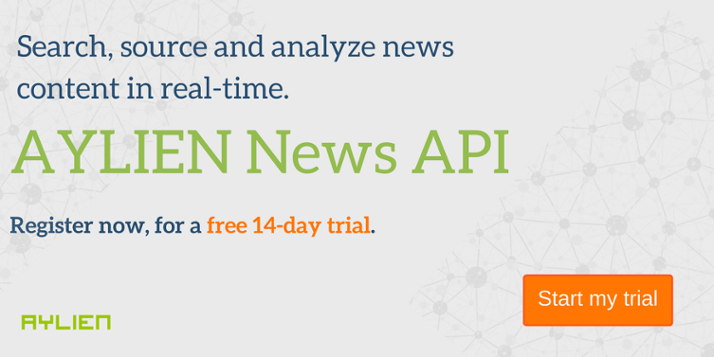 Our News API gathers, analyzes, and indexes over 2.5 million new stories each month in near-real time, so whatever industry you’re in, the News API can help you generate timely, actionable insights.